The upcoming Alien prequel isn't a prequel any longer, and won't even be an Alien movie, but will still be related to Alien, somehow. First Ridley Scott was going to direct a prequel to the 1979 film Alien, called Paradise, and it had a rumored cast. Then everything we knew about the movie was a rumor, except for the fact that it was an Alien prequel directed by Scott. Now, well, we still have Scott. Twentieth Century Fox has announced that the movie, called Prometheus, will be a stand-alone film, independent from the Alien franchise, and may or may not actually feature aliens. 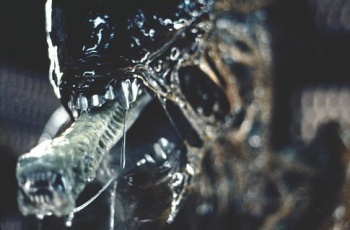 Scott acknowledges that the project began with Alien, but has since become an original story in a different universe. Even so, Deadline quotes the director as hinting, "The keen fan will recognize strands of Alien's DNA." According to the same source, Damon Lindelof (Lost, Star Trek), who has been working with Scott on the story, says "in a world flooded with prequels, sequels and reboots, I was incredibly struck by just how original Ridley's vision was for this movie. It's daring, visceral and hopefully, the last thing anyone expects." As they said we should expect an Alien prequel, they're right on target so far, but the promise of a new universe and mythology is an exciting development. Fox announced that Prometheus is scheduled for release on March 9, 2012. Swedish actress Noomi Rapace (The Girl with the Dragon Tattoo, the upcoming Sherlock Holmes sequel) has officially signed to star in the film, and actresses such as Angelina Jolie and Charlize Theron are rumored to be in contention for another lead role. Far from not believing rumors, I won't believe anything about this one until I'm actually watching it in the theater.